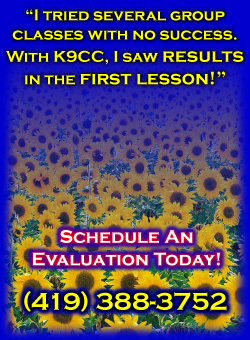 K9CC offers private one on one dog training services in NW Ohio and SE Michigan. Private home dog training allows us to look more closely at your situation and goals to custom design a successful dog training program with you in mind. Every dog is unique and we adjust our training to your dogs own personality and temperament. Private home dog training is a personalized, convenient, and highly effective solution to dog training and dog behavior problems. Why In Home Private Dog Training? We believe that private in home dog training guarantees the highest level of success. Why? The home is often the hardest area to gain control of your dog. Most bad behaviors happen in the home and the home is where most obedience commands are used. Doesn't it make sense to train and solve dog behavior problems where they occur? Only by seeing a dog interact with their own environment, can we truly understand and solve dog behavior and training issues. Adding distraction is one of the last steps in the dog training process. A group dog training class is filled with distractions. New environment. New people. New dogs. New smells. All kind of activity. With all this distraction, it can be hard to gain your dogs attention and focus for real dog training, which is why K9CC offers private home dog training. We help you teach and reinforce an understanding of the obedience commands before adding real world distractions, not the artificial distractions of a class environment. Is Home Dog Training Right For Me? Do you have your own business or work long hours? Tight schedule? Too busy to make a set training schedule? Private dog training comes to you, in your home, when you want us there! Uncomfortable in group classes? Easily embarrassed? Private home dog training can ease those fears and offer a level of comfort not found in any other private home dog training program available. What happens in our dog training lessons, stays in our dog training lessons! Or perhaps you are just frustrated and need results NOW! Private home dog training will help you achieve success! Call Today! 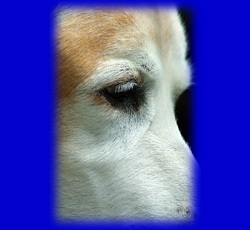 Dog Behavior Counseling. Dog Behavior Counseling goes far beyond just dog training. While obedience training focuses on teaching the dog new commands, Dog Behavior Counseling focuses on...Read More. Basic Dog Obedience. Besides professional dog training instruction, all of our dog obedience programs incorporate the same principles seen in our Dog Behavior Counseling. This partnership of dog psychology and positive training techniques offers the most effective dog training program available today...Read More. Puppy Training. Puppy Counseling will show you how to start your new puppy on the right foot. The goal of this home dog training program is to...Read More. Name Training This sounds simple, but many dogs are not properly conditioned to their own name. Name training is best described as an attention getting exercise that teaches a dog to look directly at us upon hearing their name. Leash Manners This is not precision heeling, that comes later. Leash manners educates you in proper leash handling skills and teaches the dog to walk calmly at your side with no leash pulling, jumping, running in circles around you, or other improper behavior. Many concepts from our Dog Behavior Counseling are introduced at this point in training to help address any other behavioral problems that may exist. Sit & Sit Stay Dogs are trained to sit upon the first command. Your dog is also conditioned to maintain a sit stay until released or given an additional command. Down & Down Stay Dogs are trained to down upon the first command. Your dog is also conditioned to maintain a down stay until released or given an additional command. Come Dogs are to return to the handler and sit squarely in front of him/her upon the first command. Your dog is to maintain the sit until released or given an additional command. Heel Dogs are to heel at the handlers left side in a precise manner adjusting to the handler's speed and direction without command. Your dog is also to perform an automatic sit on a stop. Place Dogs are trained to go to a specific spot such as a crate or mat and remain there until released. Many people ask how this is different from a down stay. A down stay requires a specific body posture that must be maintained while a place command allows the dog more freedom to stretch, scratch, etc. A dog may place for several hours and it would not be fair to expect a formal down position to be held the whole time. A dog can relax in the place command. This command works great to keep your dog from under foot when at home or out with the family. You always know where your dog is! Release When your dog has completed an exercise and nothing else is expected of them, a release command such as free is given and they can do as they will, providing it is not improper behavior. Leave It Dogs are always getting into things we wished they would not. When commanded leave it your dog should immediately leave alone whatever had their interest, whether it is a ball, rabbit, trash, or your evening dinner. Go to a mat or bed and place until released when guest knock/ring and enter the front door. Retrieve the phone when it rings. Retrieve a tissue when you sneeze. Find your lost keys through scent. Retrieve a cold beverage from the refrigerator.